Malan’s Dairy has delivered a wide variety of fresh produce and quality products to clients around Western Cape. Our assortment of products include various brands of milk, flavoured milk, yoghurt, fresh cream and more! Since 1948 Malan’s Dairy has delivered a wide variety of fresh produce and quality products to clients around Western Cape. We cater for the specific needs of our clients by providing deliveries that suit their business times and schedules. With a wide spectrum of products, ranging from the more affordable to high-end, we are able to cater to everyone’s needs and desires. Our assortment of products include various brands of milk, flavoured milk, yoghurt, juice, mineral water, fresh cream, butter, buttermilk, maas, cheese (gouda, cheddar, mozzarella, feta, cottage) sour cream, mascarpone and various speciality cheeses. We also distribute our own branded product line as well as redistribute for other suppliers. 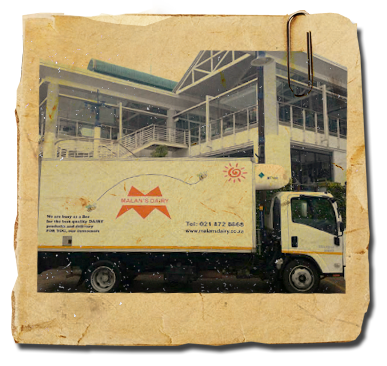 All our products are stored in refrigerated storerooms and transported in refrigerated vehicles – thereby ensuring the great freshness and quality we have become known for throughout our 60+ years of business. We also service hospitals, schools, restaurants, coffee shops & the hospitality industry – offering daily deliveries from Monday to Saturday and are flexible to our client’s operating hours.